The two streets of Royal and Prosperity comprise the heart of the area known as the St. Francisville Historic District. A high concentration of buildings dating from the early 19th century to the early 20th century line these streets, reflecting the history of the region. Such buildings as the 1905 Georgian Revival Courthouse, the c.1810 Greek Revival Camilla Leake Barrow House, and the 1909 brick Romanesque Revival style Bank of Commerce & Trust, are to be found in the heart of the commercial and government center of town. Extending down Ferdinand and Sewell Streets, the character of the St. Francisville Historic District changes. Here Bungalows, Eastlake or Renaissance Revival houses with pyramid roofs, commercial and public buildings and the later raised cottages are common. The cottages represent perhaps the last generation of a traditional Louisianan house type with Renaissance Revival influence. St. Francisville's history is closely related to the town of Bayou Sara, located at the conjunction of Bayou Sara Creek and the Mississippi River. In the late 18th and early 19th centuries, Bayou Sara grew into one of the most flourishing ports between Natchez and New Orleans. Due to frequent flooding, market places were established up on the bluff, where St. Francisville was eventually built. From 1825 to 1860 cotton continued to be a dominant commodity and vital to the commercial trade of St. Francisville. Grace Church, within the St. Francisville Historic District, was one of the finest examples of church architecture during of the time. Built in 1858, this church was as much a representation of the plantation owners' wealth as were the area's great plantation homes. 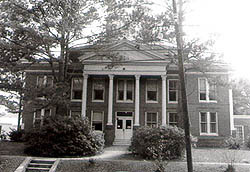 After the Civil War, the number of small merchants rose, and St. Francisville received a number of newcomers, some Jewish, who established a synagogue (later turned into a Presbyterian Church) and were largely responsible for the construction of the Julius Freyhan High School in 1907. St. Francisville's ascendancy as a major railroad-shipping center for agricultural produce and cattle produced the turn-of-the-century wealth seen in many of its buildings. 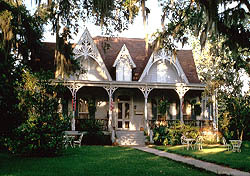 The St. Francisville Historic District is located off US Rte. 61 in St.Francisville, overlooking the place where the Bayou Sara creek joins the Mississippi River. Many special events and tours are held throughout the year. Visit the West Feliciana Historical Society for exhibits, tourist information, brochuers and guidebooks. They are open 9:00am to 5:00pm Monday-Saturday, 9:30am to 5:00pm Sundays, except holidays. For further information call 1-800-789-4221 or visit the city's website.